​In the late Spring of 2018, the Myersville-Wolfsville Area Historical Society (MWAHS) reached out to Wolfsville Elementary School students to encourage them to better understand and appreciate our rich local history. Babs Savitt, president of the historical society, asked Ed Marfut, a fifth-grade teacher at the school, whether he would partner with M-WAHS in a history-themed writing project as part of a unit about the 1940s, including what life was like on the Wolfsville homefront during World War II, as well as conditions for soldiers fighting abroad. Marfut enthusiastically agreed. MWAHS loaned the school a painting of Wolfsville based on a photo taken in 1943, which was hung in the school cafeteria by Principal Meagan Stine. Included in the painting (below) were, from left to right: George Blickenstaff, Donald Blickenstaff, Donald Pryor (behind sled), Gale Kline (on sled), Jacklyn Pryor, and Roy Pryor, who was bending over by the wood pile. After studying the era and viewing the painting, the students wrote stories spun by their imaginations. Prizes of books or certificates of achievement were awarded to all 17 fifth graders by Babs Savitt and Barbara Brittain in June. Audrey Knox, left with Babs Savitt, won first place for creating a fascinating, descriptive, and authentic story that left everyone wanting a sequel. Truly, she is an awesome young writer. ​The Myersville-Wolfsville Area Historical Society (MWAHS) has researched cemeteries and one- and two-roomed school houses, collected oral histories from elders in their communities, preserved old photos and artifacts, and provided many interesting programs. The society has also reached out to the area's children in hope of encouraging their appreciation of history. Sixty-two "personal history quilts" were displayed at the 14 June, fifth grade, end-of-year-celebration at Myersville Elementary School (MES). Families and students viewed these large, colorful, paper quilts both before and after the awards ceremony, engendering a buzz of excitement throughout the room. MWAHS partnered with Mr. Bob Ziegler, MES history teacher, on this project. Babs Savitt, president of the historical society, discussed the importance and relevance of history with all the students. She reminded them that they make their own history every day. Then the students, with the help of Mr. Ziegler and members of the MWAHS, created their own personal history quilts that included an important event from each year of their lives. The personal history quilts went home with the students and, hopefully, are hanging on the walls of their homes. 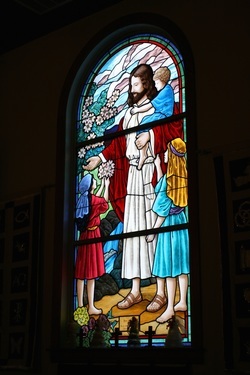 The Myersville-Wolfsville Area Historical Society's first Tour of Historic Country Churches drew well over 100 people to ten of the beautiful churches in our valley. The photographs below were taken by Mr. Jody Brumage, Vice-President, Historian and Curator of the South Mountain Heritage Society. To see additional photographs, please visit Jody's Flickr page the MWAHS's Facebook page.